Snakelike galleries are a sure sign of holly leaf miners. Holly trees play a significant role in the beliefs and traditions of the season. To the Romans, hollies were the trees of the god Saturn and wreaths of holly were given as gifts during his holiday, Saturnalia. In Celtic legends, the evergreen hollies with their beautiful red berries, announced the triumph of the Holly King during the winter season over the Oak King who ruled the forest with his green leaves in the summer. For Christians, the pointed leaves of the holly are associated with the crown of thorns worn by Jesus and the bright red holly berries symbolize drops of his blood. For a bug guy, this is the season to marvel at the native holly leaf miner, a small wonder of the insect world. Peeling back the leaf surface reveals the yellow holly leaf miner larva feeding in the gallery below. On my neighbor’s beautiful American holly, red fruits intermingle with deep green leaves. Some leaves have unusual sinuous trails on their surface. Within the trails are the larvae of small flies known as the native holly leaf miner. Back in the warmth of spring the adult stage of the holly leaf miner, a small black fly, pierced the holly leaf with a structure on the tip of its abdomen called an ovipositor. With the ovipositor, the fly deposited an egg through the tough leaf surface into the soft tissue beneath. The egg hatched into a tiny larva. The larva ate nutritious cells of the holly leaf and snaked its way through the leaf enlarging the trail as it grew. Punctures on the leaf surface indicate where the female pierced the leaf surface to feed. On warm days during the winter and early spring, the leaf miner will continue to feed until it completes its development and forms a pupa next spring. Just before the larva changes into a pupa, it cuts a small window in the surface of the leaf to enable the adult fly to escape. 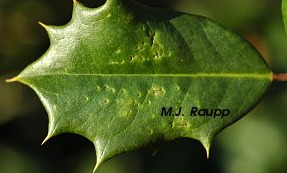 The emergence of the holly leaf miner is timed to coincide with the appearance of tender new holly leaves in the spring. In addition to laying eggs, the female holly leaf miner uses her sharp ovipositor to poke holes in the leaf’s surface. These small holes exude droplets of sap, thereby providing a source of food for the hungry female. Leaves with many feeding holes are often curled or puckered. A horticulturalist once told me that these holes were caused by holly leaves with sharp spines bumping into one another, but now we know differently. During this festive season, I always bring fresh holly branches into my home and, with any luck, some leaves will have native holly leaf miners to make the season even jollier.